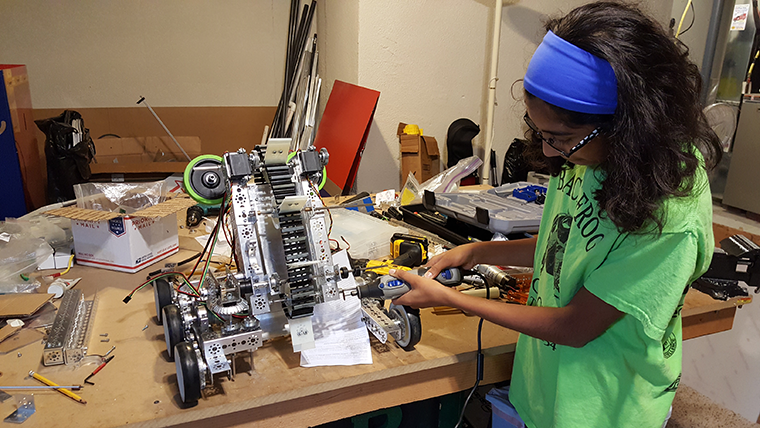 Robotics are a growing extra-curricular activity for students across the country. Students’ academic and career choices are now increasingly influenced by K-12 STEM education (Science, Technology, Engineering, and Mathematics). One example is a middle school robotics team from Novi, Michigan called Black Frog Robotics. The team has participated in dozens of competitions over the years through FIRST Robotics competitions. FIRST (For Inspiration and Recognition of Science and Technology) is a nonprofit organization which inspires young people to be science & technology leaders. This past August, Black Frog Robotics and seven nearby FIRST Robotics teams received training from Autodesk in Fusion 360. There, the students used Fusion 360’s cloud-based 3D CAD/CAM to turn their ideas into reality. The success of the training encouraged each of the teams to use Fusion 360 in their upcoming robotics competitions. “I think that the CAD class helped our team by giving all the kids exposure to Autodesk Fusion. Before the class we only really had two kids working in the CAD area. After the class more kids on the team knew what it was like to design in CAD and it sparked an interest in designing the robot.” -- Megan D., 8th grader. 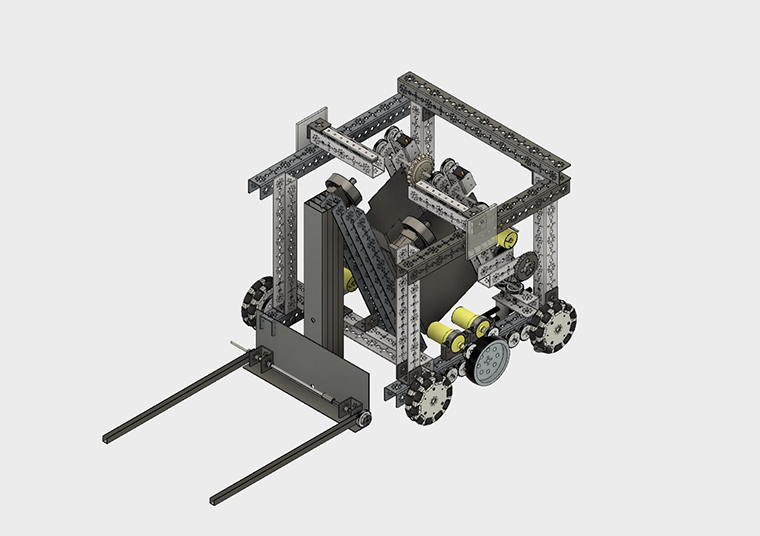 A Fusion 360 drawing of the robot used in the team's FIRST Robotics compeition. The course was led by Patrick Miller, Senior User Experience Designer at Autodesk. Patrick has been leading trainings for FIRST teams for his entire eight-year tenure at the company. He sees these workshops as a great way to talk to future designers and engineers about Autodesk. The team is also mentored throughout the season by Fuming Dai, a Principal Engineer at Autodesk who coaches the team in CAD concepts and helps students program their robots in Java. “The students in FIRST are super curious and unafraid to learn new ways to design and work together. As a UX Designer, it’s inspiring to see the light bulb go on when they realize what they can do with Fusion and their robot designs.” – Patrick Miller. Black Frog Robotics were honored with an Inspire Award both at their regional qualifier and their state level competition. The team was also nominated for a Parametric Technology Corporation (PTC) Design Award, which recognizes innovative industrial design and excellence in teamwork and professionalism. They’ll be moving onto the North Super Regional FIRST Tech Challenge competition in Cedar Rapids, Iowa at the end of March. 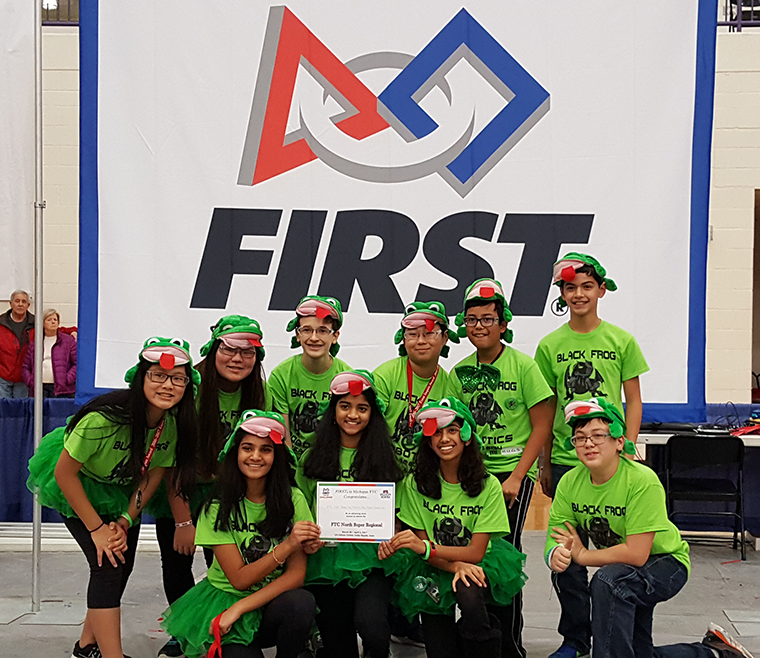 “Autodesk’s support has guided us to our nomination for the PTC Design Award at our regional qualifiers, as well as at the Michigan State Championship.” – Black Frog Robotics. The Black Frogs robotics team winning the Inspire Award at the FIRST Michigan State Championship. Autodesk is an official sponsor of FIRST, supporting the organization's mission of engaging students in science, engineering, and technology skills. As a technology provider, Autodesk provides free access to Autodesk 3D design software and learning resources for students and faculty participating in partner programs. 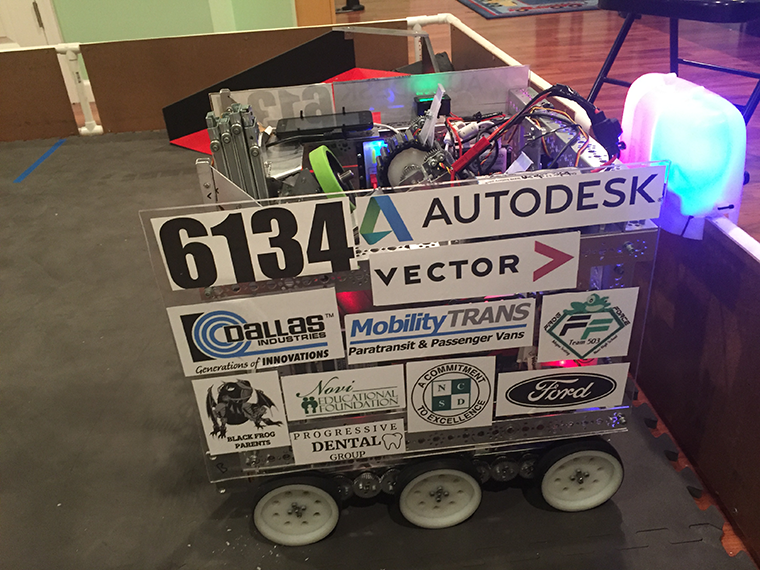 View projects from FIRST Robotics and other Autodesk partners on Our Partners page. “We would like to give a big thank you to Autodesk for all the support they have given to us. We would not be where we are right now without them.” – Black Frog Robotics. Have your own robotics design to share? Show off your design in your Portfolio. Want to learn how to create your own robot? Looking to be inspired by others making and using robots? Check out the links below and get started. Explore ways to create a higher performing robot using rapid prototyping and 3D printing. Learn about mechanical power transmission and gears and how they work. Learn the basics of Fusion 360 and then try out your skills by designing a robot straight from your imagination. Read how 15,000 students from 30 countries participated in the largest robotics competition on the planet. Cole Barnett uses Autodesk software and 3D printing to build a robot. How Fusion 360 and 3D printing helped designers bring their dream combat robots to life. At 10 years old, Lisa Winter decided she was joining the BattleBots competition. It's clear she found her tribe. Make a robot in your bedroom? Learn how architecture students are exploring the use of robotics for fabrication. The use of robotics in fabrication is changing the way architecture students design.